Plants annual; loosely tufted. Culms 10-60 cm, erect, geniculate, or ascending; nodes glabrous. Sheaths glabrous or slightly pubescent; ligules 0.2-0.8 mm; auricles absent; blades to 10.5 cm long, to 4.5 mm wide, sparsely to densely pubescent on both sides. Spikes 2-9 cm long, 3-7 mm wide, erect, often partially enclosed at maturity, pale green. Glumes straight, not divergent at maturity. Central spikelets: glumes 8-17 mm long, 0.5-1.5 mm wide, distinctly flattened near the base; lemmas 5-8.5 mm, usually glabrous, sometimes sparsely to densely pubescent, awned, awns 3.5-9.5 mm; anthers 0.7-1.8 mm. Lateral spikelets usually sterile; glumes to 18 mm; lower glumes distinctly flattened, more or less winged basally; lemmas 2.5-5.7 mm, usually awned, awns to 1.8 mm, rarely unawned; anthers 0.6-1.2 mm. 2n = 14. 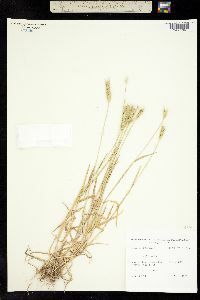 Hordeum pusillum grows in open grasslands, pastures, and the borders of marshes, and in disturbed places such as roadsides and waste places, often in alkaline soil. It is native, widespread, and often common in much of the Flora region. Its range extends into northern Mexico, but it is not common there. This species is found usually in slightly acid soils in waste places and fallow fields and along railroads and roadsides. It is infrequent to local in the southern counties and has been found in four of our northern counties in waste places and along railroads. I think that this species has been introduced into the state and I am so recording it. 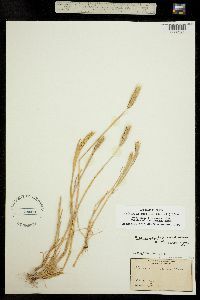 Spillman found it in Knox County in 1890, and, although Schneck reported a wild barley earlier, there is no specimen to verify the report. Our early authors, Baird & Taylor, Barnes, Clapp, J. M. Coulter, and Young, who collected intensively in some of the Ohio River counties, did not report a wild barley of any kind. This evidence, in addition to its habitats, convinces me that it has invaded the state since that time. Annual to 4(-6) dm; lvs flat, 2-4 mm wide, erect, without auricles; spikes 2-7 cm (excl. awns), erect; central spikelet sessile, the lateral on curved pedicels 0.3-0.7(-1) mm, their florets reduced, awn-tipped, and borne on curved rachilla-joints ca 0.5 mm; glumes 7-12(-15) mm, those of the central spikelet and the inner glumes of the lateral spikelets slightly to conspicuously broadened above the base before narrowing into slender awns, the outermost glumes wholly awn-like and somewhat shorter, scabrous to puberulent; fertile lemma 5-7 mm, scabrous, faintly 5-veined, tapering into a short awn (4-)5-8 mm; anthers 0.5-0.8 mm; 2n=14. Native weed of pastures, roadsides, and moderately moist waste places; Del. to Fla., w. to Wash., Calif., and n. Mex., and casually intr. n. to Me., Mich., and Minn.; s. S. Amer.